The bee is coming along. I decided to break out a bit and paint this one slightly larger than the Buzz set. It’s been a couple of years since I painted a bee but, as I still have a habit of collecting dead bees I found I had 6 very good little Tree Bumblebees in a pot. It is very helpful to have a specimen to work with. 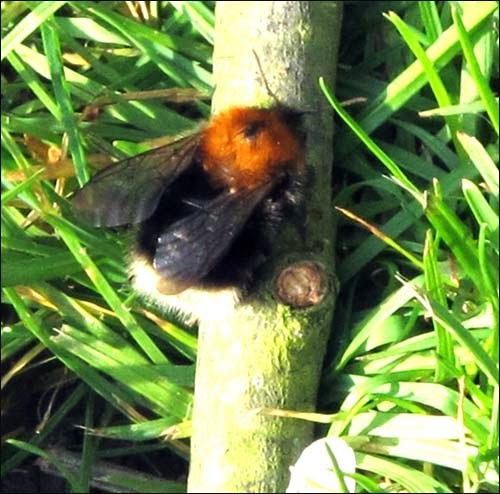 The tree bumblebee is by nature quite feisty and will sting when it thinks its nest is under threat. I first saw one of these very attractive ginger black and white bees at Easton Walled Gardens back in 2011. It was foraging amongst the glorious blossom of a cherry tree. A few years later,again at Easton, they had made a nest in one of the lovely old stone walls which surround the Gardens. Most recently, apart from seeing them every year in my garden, a colony has set up home in a tree stump in the Spinney. Unfortunately the stump was also the home to a geocache box, so whoever wanted to record their presence would have to contend with some rather angry bumblebees. They have a reputation for taking over old birdboxes and are definitely a bee that likes to site its home up and off the ground. The rough tracing of the cherry, which I changed in the end to simplify the pencil work. About 3/4 finished… and on the right preparing to paint the wings… always a bit tricky!